Sweet All Heart Lap Quilt features a variety of different-sized hearts with flowers and other designs in hear centers. All Heart Lap Quilt is finished with hand quilting. All cotton. Imported. 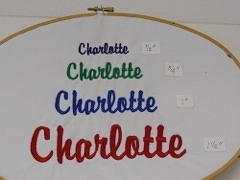 There is 2.5 inches along the border to personalize with someone's name and special date in custom embroidery. You could also easily turn this into a wall hanging by adding loops on the back.